If you are an author or a reader at ghumakkar.com and are wondering why your picture does not appear along with your comments, you have reached the right place. Go to http://www.gravatar.com/. . In the email field, specify the email address that you have registered at ghumakkar.com and click Signup. This email address will most probably be the one on which you receive the regular updates from Ghumakkar.com. You will receive a Welcome Email from Gravatar at the email address that you have specified above. The email will contain a link to activate your account at gravatar. Click the link. The link will take you to the gravatar page where you can create your account. After creating your account, the Gravatar home page will be displayed, where you need to click the "Add one by clicking here!" A list of options to select your gravatar image from will be displayed. Select "My computer's hard drive". Upload the picture that you want to use as the profile picture for Ghumakkar.com and other blogs on Wordpress. You will be prompted to select the appropriate rating for your gravatar. Select the applicable rating based on the definitions given on the page. Next, the home page appears again. 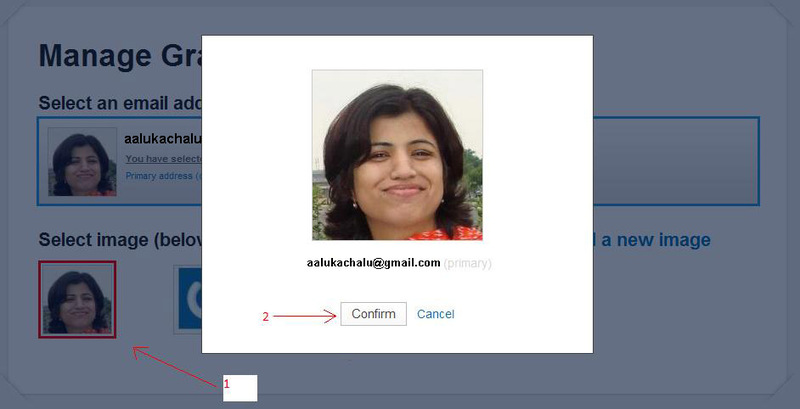 Just click on the image that you want to confirm as the primary gravatar profile pic (1) and click on the confirm button in the pop-up (2) as illustrated in the image below.